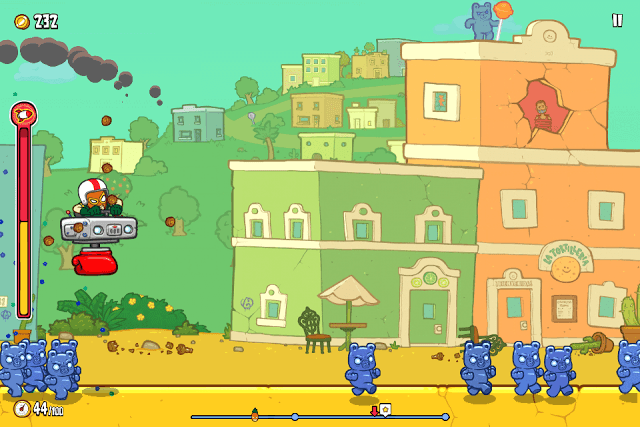 Burrito Bison: Launcha Libre is an action game from Juicy Beast and Kongregate. 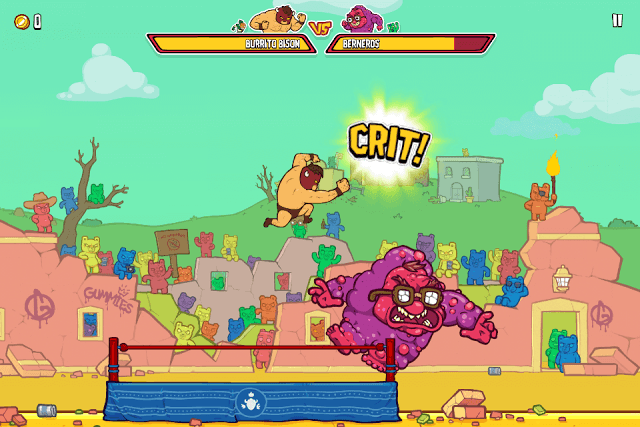 Sort of an endless runner, the game lets you launch a wrestler high up in the air to destroy gummies, defeat evil opponents and earn coins. It pits you against a quirky opponent, which acts as a punching bag and launch pad. Hitting the opponent will reduce his HP and send your hero high up in the air. The fun begins when he lands on gummy bears and this is when you will have to make sure that he keeps bouncing off little candy bears and does not hit the ground. Launching your hero at the right moment will increase the chances of getting critical hits. You should try to launch your hero when the opponent taunts him. Crit hits reduce opponent’s HP considerably and when it hits 0, a lovely animated KO is shown. Plus you get lots of coins. Every opponent you will be facing has a unique way of taunting your hero. Their actions give away major hints as to when your hero should be launched. For example: You should launch your hero when Harry Bow-Tie screams at him or launch him when the burly Bernerds points his finger at your hero. When you have chosen a new opponent, observe his actions and then launch your hero. It will take a few more replays before you can easily time your launches perfectly. Use rocket when your hero is about to hit the ground. Hitting the ground will slow him down and if he keeps falling on the ground, it will be game over You should also save rocket slams for those moments when the Bomb carrying Jelly Rogers and Teddy Flare appear floating in the sky. Do remember that you can use rocket twice in the game when the meter’s full. You also may rocket slam gummy bears when the meter is at 50 percent. Buy upgrades as it will help you stay in the game for a longer period of time. You should first buy those upgrades that will increase your hero’s speed and make him bounce higher. Bounciness, Slippery Lotion, Flavor Master and Speedometer are some upgrades you should consider buying and upgrading further. Buying them will let your hero stay in the air for some time longer. You should buy the Cake Eater upgrade if you want to slam through giant doors effortlessly. The higher its level, the easier it will be to rip through the inside of giant door, which act as an obstacle between your hero and the new world. Also buying and upgrading speed upgrades will also let you smash through the giant cake wall easily. 5. Special Gummies to Your Rescue! Burrito Bison: Launcha Libre has some really cool gummies that can be purchased with coins. Once you purchase a special gummy, it will start appearing in the game, helping your hero gain more speed or stay up in the air for a longer period of time. Each special gummy has a unique ability. Puncheous Pilot has a funky punching machine that can easily squish those evil gummies into pulp. LT. Jel E. Boom gives your hero some serious speed. Jelly Roger carries a bomb that will blast your hero up. Teddy Flare will shoot your hero up in the sky. Upgrading special gummies will let your hero punch harder, gain more speed, reach higher up in the sky etc.